I discovered Sweet Lauren Cakes at the Williams-Sonoma Artisan's Market. If you haven't been before, it is a monthly event held at Williams-Sonoma, with assorted local guest food artisans. Most are not normally sold inside the store, but if they are well received, then it is a path forward for them. The selection varies each month, but usually includes things like pickles and preserves, chocolates, and my favorites, baked goods. I was drawn over to Lauren's booth by the beautiful display of cute little cake pops, her specialty. 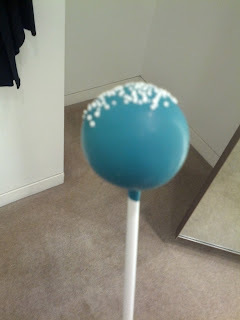 Cake pops are cake mixed with cream cheese frosting, then coated in colored white chocolate, on a stick. Usually decorated with some sprinkles too. Since my first encounter, I've run into her at other events in the city, and she even remembered me! Well, Rubio's has done it again. They introduced another new concept to their menu: grilled chimichurri salmon. Available as a taco, burrito, or salad. All three offerings include the grilled salmon, topped with their housemade chimichurri sauce: "a savory blend of basil, parsley, chives, garlic and olive oil", along with fire-roasted corn, fresno chiles, and crema. For the salad, these components are served atop a bed of mixed greens, along with avocado slices. For the burrito, rice and beans are added. And for the taco, some mixed greens, and a warm flour tortilla. Since I'm kinda in love with Rubio's, I obviously had to rush in to try out the newest item. I really like that they regularly introduce new items to their menu, whether it be a new seafood choice, or just new sauces or tweaks to other recipes. The menu continues to feature their classics, like the original fish taco, which I can't imagine going anywhere, but other items rotate through. Of course, this means there are some losses, like my absolute favorite, the sesame soy fish taco, which is no longer available. And there are items that come and go seasonally, like the langostino lobster. But still, I really appreciate that they aren't afraid to mix it up. Since I've reviewed Rubio's a zillion times, I'll skip the general details about the place, and just focus on this visit. On my other visits, I've mostly gone in evenings, or on Saturdays, when it is never very crowded. This time, I went at 12:15pm, on a weekday. It was such a different environment! It was packed. Every table was taken. Strangers were asking to share tables. Wow! I was able to find a single stool at the bar along the window. Even though it was packed, service didn't falter. I still can't get over how friendly the staff always are, genuinely greeting me with enthusiasm when I order. My food was ready quickly, I had just enough time to claim my seat, fill up my salsa containers at the salsa bar, and settle in, when my pager went off. Since it was so busy, they were actually using the pagers this time, rather than doing table service. "Sustainable Atlantic salmon grilled and topped with chimichurri sauce - a savory blend of basil, parsley, chives, garlic and olive oil, fire-roasted corn, crema, fresno chiles and spring mix. Served on a warm flour tortilla and garnished with a slice of lime." I've gone back and forth many times on which of the Rubio's tortillas I prefer. At first, I appreciated the corn flavor in the corn ones, but thought they were too gummy. Then one time, I had a corn one that was really crisp, and loved it. So when the woman taking my order said, "now, that comes on a flour tortilla, did you want corn instead? ", I was a bit paralyzed. I wasn't going to suggest the switch, but she brought it up, totally unprompted. Fondly remembering the really good corn tortilla I had that one time, I bravely went for it. I wish I hadn't. It wasn't crispy like that time. It also wasn't strangely soggy like I've had before, but I think that is because it wasn't even warm. The tortilla was really disappointing. The spring mix was clearly fresh and crisp. I've seen it before in their other tacos, but I was still surprised at the quality of the spring mix, and the assortment of various lettuces included. I do prefer the slaws instead though, as they give a better crunch. I've had their salmon once before, when I stole a bite of Ojan's blackened salmon taco. Back then, I really didn't care for the salmon, and found it to be way too fishy for my taste. Unfortunately, I felt similar this time as well. I had two seemingly different pieces in my taco. One was, like Ojan's, fairly fishy. The other wasn't at all. 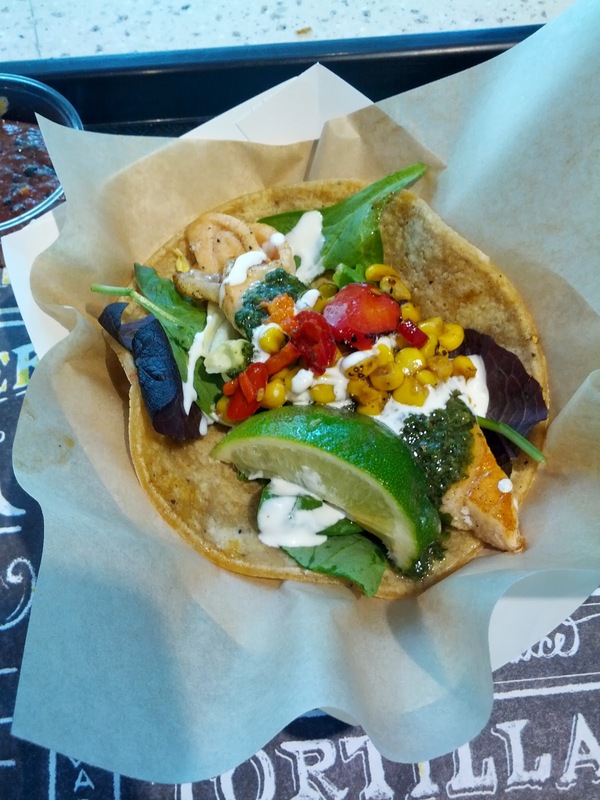 I've always be impressed with the quality of the seafood at Rubio's, so I was saddened to have a repeat experience of the less fresh tasting salmon. It was also strange that one piece was so fishy, and the other wasn't. Very disappointing, but both pieces were well cooked, nicely grilled. The fire-roasted corn and fresno chiles I'd seen before, and I again really liked them. The corn was perfectly roasted and the chiles brought a delightful level of heat. The star of this taco was the new chimichurri sauce. Like all of their sauces, it was delicious! So flavorful and fresh tasting. I did think it was too oily however. The taco turned out to be a huge mess to eat, just dripping in oil. The flavor was all there though, they just need to cut down the oil a bit, and this will be a hit. The creamy crema complimented it perfectly. No other salsas were needed, although their extensive salsa bar provides many choices. Given two negative salmon experiences at Rubio's now, I won't be getting the salmon again. Which is fine, because there are so many other amazing choices, but I don't really understand how they can have such high quality with everything except the featured catch! The chimichurri was good, and if they rein in on that oil, I'd like try to get it added to a different fish option. My friend Emil is from Sweden. He recently took a trip home, and asked if there were any treats I'd like him to return with. The answer was easy: liquorice! The Swedish do not mess around with their liquorice (they also spell it in a more interesting way). It isn't strawberry flavored, or loaded full of sugar. It has some bite. You TASTE the anise flavor. My favorites are the super salty ones. 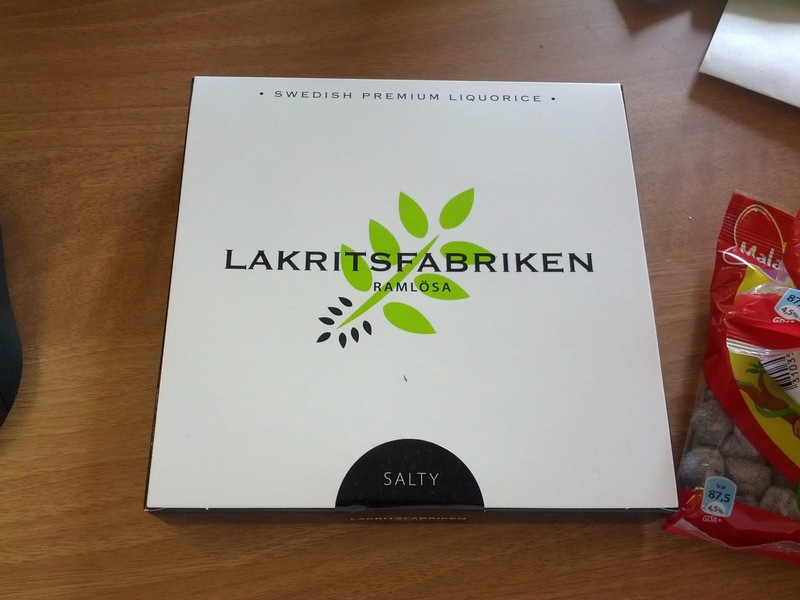 Whenever I visit candy shops in the US and ask about their salty licorice, I'm always told that "oh, it is really salty, you might not like it, it is an acquired taste". Well, I've acquired it. He brought back an assortment of licorice, certainly the fanciest I've ever seen. Frosted Chocolate Glazed Liquorice Sticks. First, the presentation! 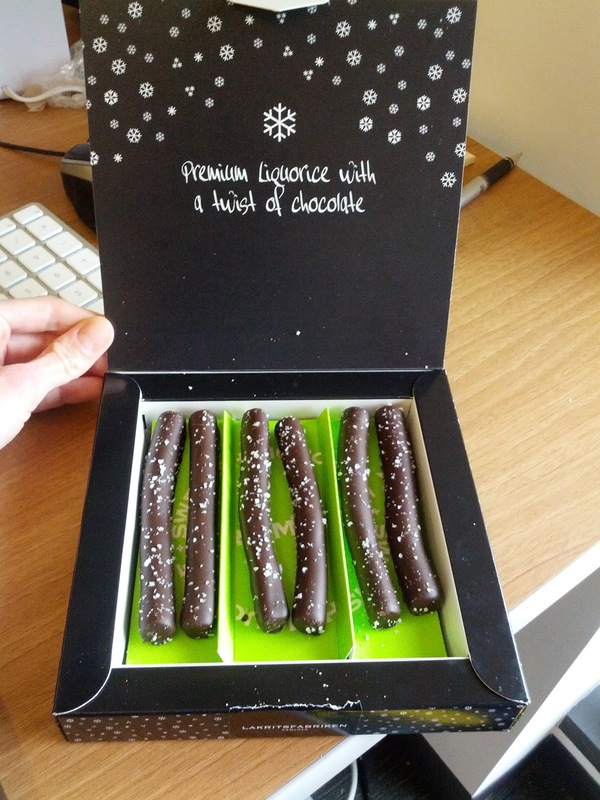 The box opened up to reveal two layers of liquorice sticks. The liquorice was their 6% salty liquorice, coated in 63% Valhrona dark chocolate, and then rolled in flakes of fleur de sel. The salt and chocolate combination was a real winner. The liquorice and salt combination was also a winner. The whole thing together was a bit odd however, as the chocolate almost masked the liquorice too much. Luckily,the quality of the liquorice was so high that it was able to shine through. I really liked the soft, yet slightly chewy, texture. These were really interesting, but I think I'd prefer to just taste the liquorice, hold the chocolate. 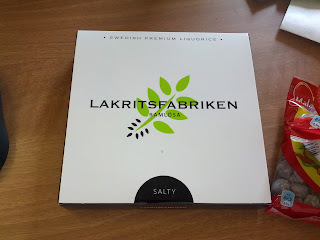 Next up was their standard salty liquorice, made with 6% liquorice root. It had a good chew, decent flavor, and a slight amount of saltiness. If it were a US liquorice, I'd say it was phenomenal, but I was expecting either stronger anise or more salt. It was still very good, and I'd eat it again. 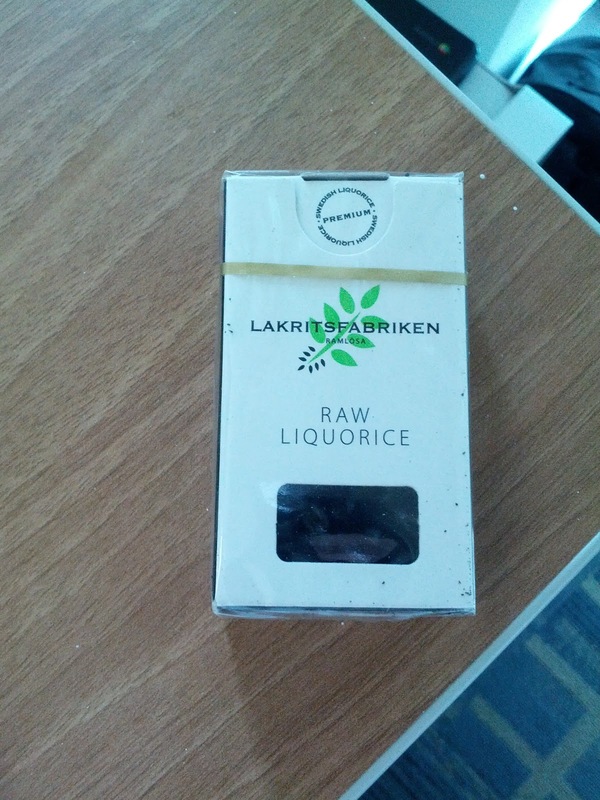 What is raw liquorice anyway? Just that - 100% organic raw liquorice Nothing else added. Their regular products are only 6% liquorice. First, it isn't soft and chewy like the others. It is more like hard candy. And, as you'd expect, intensely liquorice flavored! These were really intriguing, but I missed being able to chew on the liquorice. Still intensely tasty though.